What It Is: JAPONESQUE Pixelated Color Eye Shadow Palette ($38 @ ulta.com japonesque.com) - Pixelated Color Eye Shadow is Japonesque Color's most multidimensional formula. Blend these micronized color pigments effortlessly onto outer eye corners for a deep, light-catching, color-shifting gradient. The Pixelated Eye Shadow Palette includes everything you need to conquer the cut crease: three exclusive Pro Basic shades to pair with Pixelated Eye Shadow. My Take: Since I always use a close-to-my-own-skintone base color on my lids before applying any color, I really like that this has 4 basics inside. And they can be used for contouring if you dab a little of this color and mix it with a little of that! The Pixelated shades are gor-ge-ous to look at. So how did they perform? Click after the jump to find out! 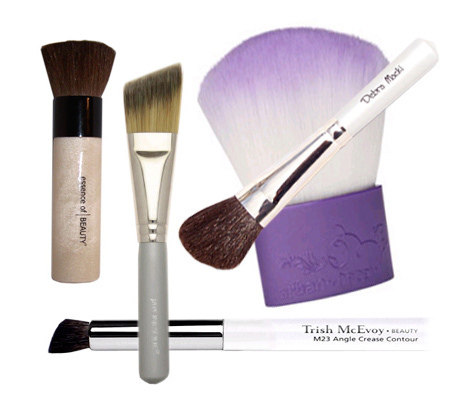 In continuing our coverage of great makeup brushes, we have some more recommendations. Some are brand new and some are not but they all get the thumbs up from us. URBAN DECAY’s new Big Buddha Brush ($36 @ ulta.com) is their answer to the kabuki brush. It’s 3” tall and 2” wide and made of the manmade fiber, Taklon. Use the tip of TRISH McEVOY #23 Angled Crease Contour ($32 @ saks.com) to get color deep into the crease and then use the flat part to blend the color in. JAPONESQUE Travel Angled Foundation ($23 @ dermstore.com) brush is made from Taklon and is pointed to help you get into those corners around the nose. DEBRA MACKI Angled Blush Brush ($28 @ debramacki.com) is made with pony hair and the angle helps sculpt the perfect cheek. ESSENCE OF BEAUTY Blender Brush ($7.99 @ cvs.com) is made of natural hair and especially for mineral makeup and will blend, blend, blend your bronzer, foundation or blush. Big recommendation.